Size – Average length around 70 cm. Maximum about 120 centimeters. The young are very thin – like a pencil. The adults are thick – like a forearm or even a human leg. Description – Triangular head distinct from neck. Color varies quite a bit. Brown with incomplete orange bands on the dorsum and laterals, or brown with beige bands, or black with grey bands. Many variations. Sometimes the snake appears quite orange. Range – All over Thailand and almost always beside or in water: Pools, streams, rivers, puddles, lakes. They are not found on hills or mountains. Food – Prey includes fish, frogs, and tadpoles primarily. Behavior – The water snake Homalopsis buccata lives in fresh and salty mixed with fresh – brackish water. 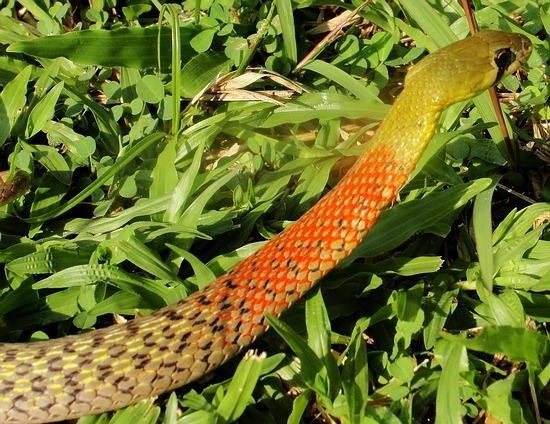 These snakes live in and near any body of water – natural or man-made. Puff-Faced Watersnakes are found almost always in the water or on the bank. Small holes in the bank are often home for these snakes. This snake is primarily active at night, but I have found a few during the daytime. Young – Born alive without eggs. Coloration – orange and black bands. Danger – I’ve found dozens of these snakes and they are typically strong and active biters. They can strike like a viper – backward and vertically. I’ve been bitten in the finger by a 70 cm. long snake when I was 5 inches away from the head, coming from behind to grab the neck. With the bright headlamp in his eyes, I don’t know how he could have possibly seen my hand coming. It wasn’t a glancing strike, he bit and held on for a couple minutes. I have heard others say these snakes don’t tend to bite. Maybe they are talking about in their experiences in the pet-trade. Length: average snakes are up to 50-90 cm as adults. Habitat: Tentacled water snakes are found in lakes, rice fields, streams, and other shallow water that is either moving or stagnant – especially that which is murky. It is found in all three types of water environments including salt, fresh, and brackish (combined) water. This snake waits patiently on the bottom and waits for something to wander by – whereupon it seizes it in it’s mouth. Amazingly the tentacled snake can stay underwater for 30 minutes on a breath. During the dry season in Thailand – from January to April, the Erepton tentaculatus buries it’s body in mud to stay wet and cool, with it’s head out of the moud – of course. They do need oxygen to survive. Active Time? When night is falling it is known to be more active. Food: Fish. To lure the prey closer to provide the opportunity for a strike these tentacled snakes use their tentacles as lures – like tiny worms. When the fish come closer they strike. When striking their eyes are retracted and they aim for where the fish will be, not where it is. This is an amazing feat. In actuality the snake is tricking the fish with a movement of it’s body – into fleeing. But, it knows exactly where it will go when it flees. A very unique snake. Defensive Behavior: Bites when provoked, but not with normal handling. Venom Toxicity: Weak venom that is not known to affect humans much. Not deadly. These are not biters, per se, and even when handled they are not known to bite much. The fangs are small, in the rear of the mouth, and the fangs are only partially grooved, not made for injecting large amounts of toxic venom. Their venom works well on fish they eat. Offspring: Each year this water snake gives birth to a half to a dozen live young which are between 20 and 40 cm in length and about a pencil’s diameter in girth. Notes: Because it spends it’s life buried in mud, or under the water looking for prey it is a rather difficult snake to catch. Recently on a herping trip in southern Thailand I believe a group of us saw one, but, when we reached in with the tongs to attempt to grab the snake, it had already darted. These snakes are either lightly striped or have blotches. Their color is either hues of grey or brown. Classified by, Lacepede in year, 1800. Length: As large as 2.75 meters (8+ feet) Recently I caught one that was about 2.5 meters. They are thin snakes and have a pronounced vertebral ridge and color bands of tan, yellow, brown and black. Range: These Dog toothed cat snakes are found only in southern Thailand from Prachuap Khiri Khan and southward to Malaysia. We found two Boiga cynodon in Krabi and one in Nakhon si Thammarat over the past year. Other countries B. cynodon is present: Indonesia, Singapore, Philippines. Habitat: Though they shy away from locations humans frequent they can be found on resorts in southern Thailand especially where there are chickens, eggs, and birds in cages. Typical habitat for the Boiga cynodon is the edge of rainforest where they are arboreal, spending most of their time in the trees and bushes waiting on the perfect bird meal to land. They are known to live in palm plantations as well. Active Time? Nocturnal, active at night usually – but, we found one during the day as well. Dog-toothed Cat Snake – Venomous – Not Dangerous. This one is darker than usual – it has an abundance of melanin, and is ‘melanistic.’ Photo by Tom Charlton. Food: Birds of all sorts, and their eggs. Birds, chickens, and quail in captivity. When hungry will also eat other animals – lizards are most likely. Recently we caught a large specimen of 2.4 meters in length which was crawling across a road toward a frog pond. There are herping forum postings of a captive animal eating mice. Defensive Behavior: Rarely bites, this is a big snake that can be hand held until aggravated. Venom Toxicity: Though they rarely bite – even when physically attacked – they can inject venom. They are rear-fanged colubrids and a prolonged bite could cause swelling and pain at the bite site. The venom can cause problems with circulation. A simple bite from this snake is not usually dangerous because the rear fangs don’t sink in during a typical bite. There are two larger than average front teeth resembling fangs. Offspring: Six to twelve eggs laid. 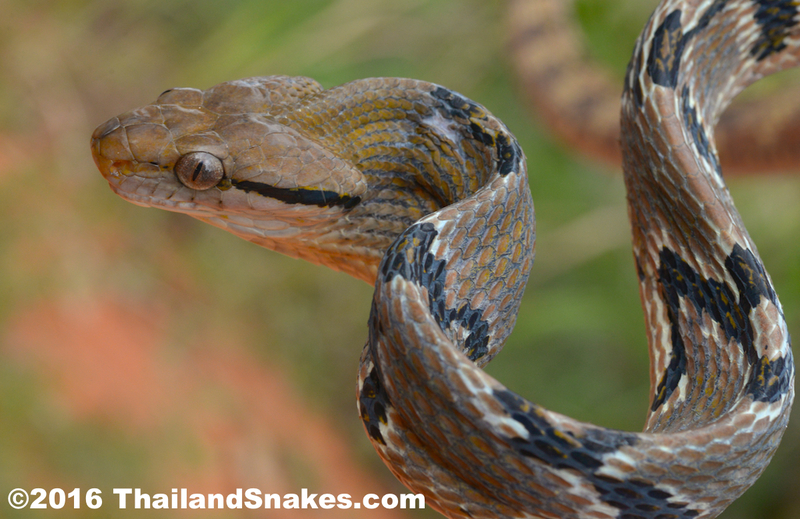 Notes: These are beautiful snakes here in Thailand – perhaps more so than the rest of Asia where they are known to be found. A couple of specimens were found locally in Krabi in southern Thailand at night and near a chicken farm in one case, in a tree on another herping field trip. These snakes are known to eat local Thais birds in the cage, and then not be able to get back out through the slats in the bird-cage, and so entrap themselves. Coloring on these snakes varies greatly. You can see the two snakes in these images here, they were both from the same area. They are dramatically different in coloration, the darker one having an excess of melanin. Dog-toothed cat snakes are sometimes confused with vipers because their head is quite pronounced in size from the size of their necks where it meets the head. There is no viper that gets anywhere near this big – so, you can discount vipers if the snake is 1.5 meters or longer. 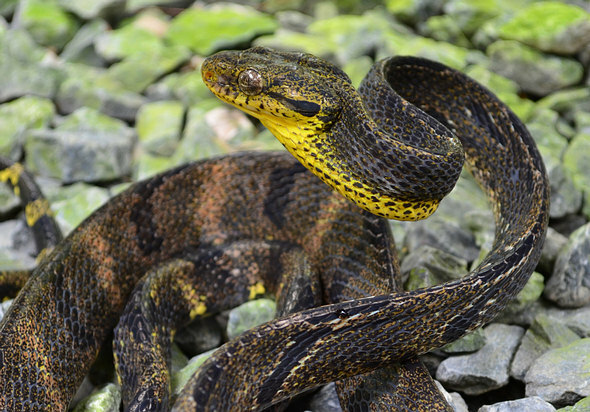 Only the Chain Viper (Russell’s Viper) reaches 1.5 meters, and it is considerably thicker in size at the neck. If you are in Thailand’s deep south,the Sumatran Pit Viper can reach around 2 meters in length. A lighter-shade of Dog-toothed cat snake found in a palm tree at night in Krabi province. This one was nearly 3 meters long. 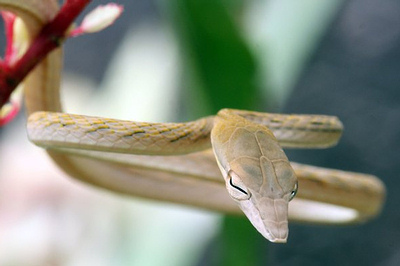 The oriental whip snake is a very common rear-fanged venomous snake found here in Thailand’s rain forests. You can find these snakes in the trees during the day, I have even seen them crossing my path twice on trips up a small local mountain in southern Thailand. The beauty of these snakes is legend. 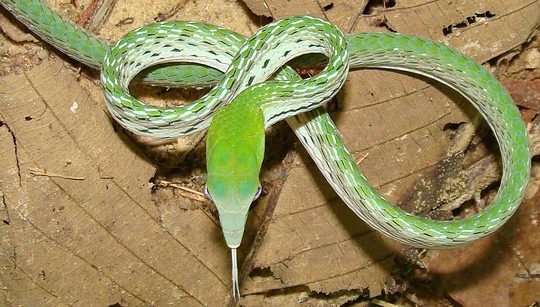 There are green, yellow, or grey phases of this snake, all of which are spellbindingly beautiful. 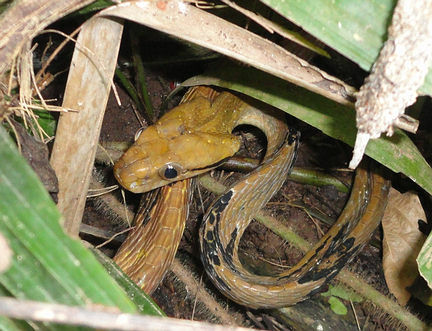 The juvenile whip snakes are often brown or yellow. Length: Up to 190 cm. Girth: Body is finger thin, tapering to a very thin pencil-width neck. The head is spear shaped and bright green. Range: All over Thailand. The species ranges from India to China and throughout Southeast Asia. Habitat: During the day you can find these snakes in trees and bushes usually. Occasionally they will be at ground level hunting frogs and small lizards. 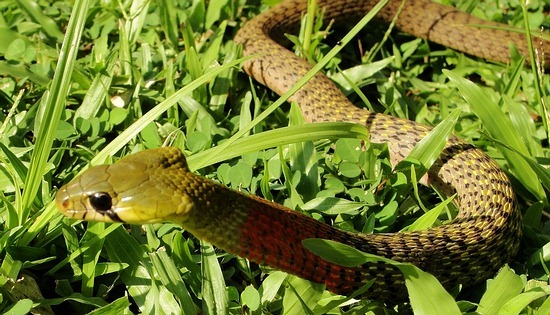 I have seen these snakes in all kinds of habitat, but usually in trees and leafy bushes. At night these snakes sleep in the same environment. Active Time? Diurnal – active during the daylight hours. Food: Frogs, small birds, small lizards. Defensive Behavior: The oriental whip snake can spread it’s neck area to increase by double in size as a defensive technique designed to scare attackers. It is quite beautiful when either solid green, or with the green, white and black checkered pattern displayed in full defensive posture. Sort of comical is what the snake does with it’s tongue when molested. It sticks the tongue out and holds it there for some seconds, or minutes. Venom Toxicity: Weak. Although this is considered to be a rear-fanged and venomous snake it is not very dangerous to humans due to it’s non-aggressive nature and weak venom characteristics. The venom would need to be injected into the wound with time – with a chewing motion. 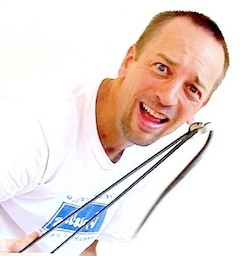 Not many people bitten are going to let a snake hang off them for any amount of time. Some do, and they may have severe complications and require hospitalization. Offspring: In Thailand the Ahaetulla prasina can mate during either of two times. Usually between April and July, and then also between December and January. Gestation period: ~ 6 months. Number of births: 4-10. Lengths at birth of offspring: 400 – 500 mm. Notes: These are wonderful little snakes to catch and let go. 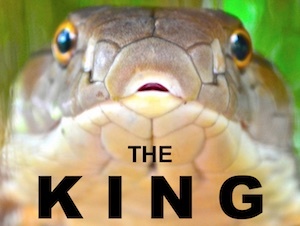 These snakes do not do well in captivity and many die within days of being kept in an enclosure. They are as beautiful as snakes get, but please resist the urge to capture one to keep as they are very sensitive and die easily. We have not been bitten by these snakes, but in the wild when catching them they will attempt to strike at times. They are fast and have a short striking range. What is really amazing about these snakes is the way they effortlessly glide down a hill or through trees like on ice. They can climb extremely fast and disappear before you have a chance to grab them. 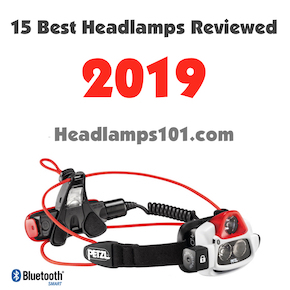 See video below! 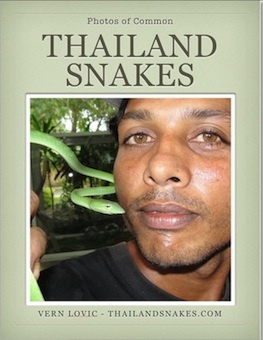 These snakes are not often confused with other snakes here in Thailand because they are quite distinctive. Their head is long and to a fine point. They are very thin at the neck before the head unless they have flared up in defense. Sometimes they are brown. Juveniles are usually brown.